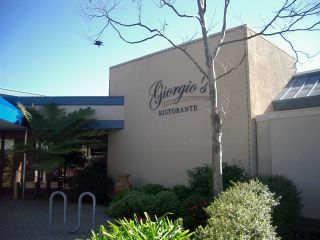 It wasn't until I had been working for three and a half years in Marin, that someone mentioned Giorgio's to me. I checked their website and it sounded idyllic. It is true that they have a pretty outside terrace with views of the water and that, paired with a promise of Italian food, made me eager to try it. The first thing that struck me when I walked through the door was the average age of the clientele. The restaurant was nearly full but there was barely a person under sixty-five. Myself, Fred and V made the total number of youngsters (and we are hardly spring chickens) about four. This didn't put me off in the slightest. We were surrounded by mature, wise, experienced people who at first glance, seemed to enjoy food and wine. I was hoping I'd made a fantastic discovery. A visit to Giorgio's always starts well, with a basket of delicious warm bread nestled inside a crisp white napkin. 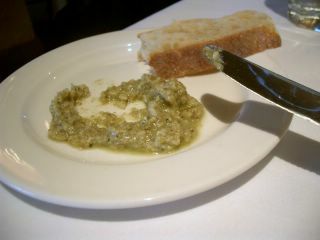 This is served with a thick, garlicky green olive tapenade, that is so totally moreish, it's difficult to limit your intake of bread when slathered in the stuff. The service is painfully slow, this lunch spot doesn't appear to be populated by a work crowd so the service has no sense of immediacy. On our last minute we waited 40 minutes for our meals, by which time we'd already filled ourselves up on this complimentary appetizer. 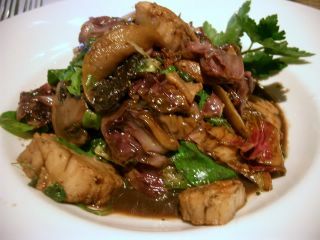 Contrary to the description on the menu, this dish was a bitter-tasting melange of seafood and vegtables all stewed (no evidence of searing) in an excess of thin brown liquid. It was inedible. I pushed it to one side. My friend V was struggling with one of their enormous sandwiches. I had ordered the same thing on my previous visit and remembered that eating the enormous bread wedges, filled with half a pound of meat and unexceptional fries was a chore rather than a pleasure. The staff kindly noticed that I wasn't eating my meal. I explained that I didn't like it and they offered to get me something else instead. I politely declined, I'd already eaten enough bread, plus Fred let me have a slice of his pizza. The pizza is decent enough. 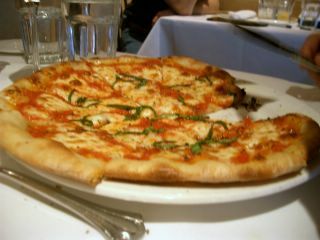 A standard margherita with some oil in the dough, nice and crispy. Not bad. They kindly took my portion off of the check. It was a nice gesture, but probably not enough to persuade me to go back a third time. The menu has potential, but they don't seem capable of executing it well. Will I return again for more? Unlikely.